Audion EL34 Stereo amp. TAS rave reviews. Stereo SET Amplifier. In use, the Audion proved to be quite a joy, as its controls were simple enough once one had got used to the unorthodox lever switch arrangement. It behaved itself immaculately during testing and appeared to have plenty of power and heft to drive the AN-J loudspeakers. So let’s go back to the company’s mission statement for producing equipment that delivers great sound for the money? Have they achieved that? Well, I would have to say that the Sterling EL34 Anniversary has succeeded in spades. It is not a huge amount of money for such a sweet-sounding, detailed and musical performer. This Audion amp is hard wired point to point using higher grade components and larger, hand-built, Audion wound output transformers (EI96). 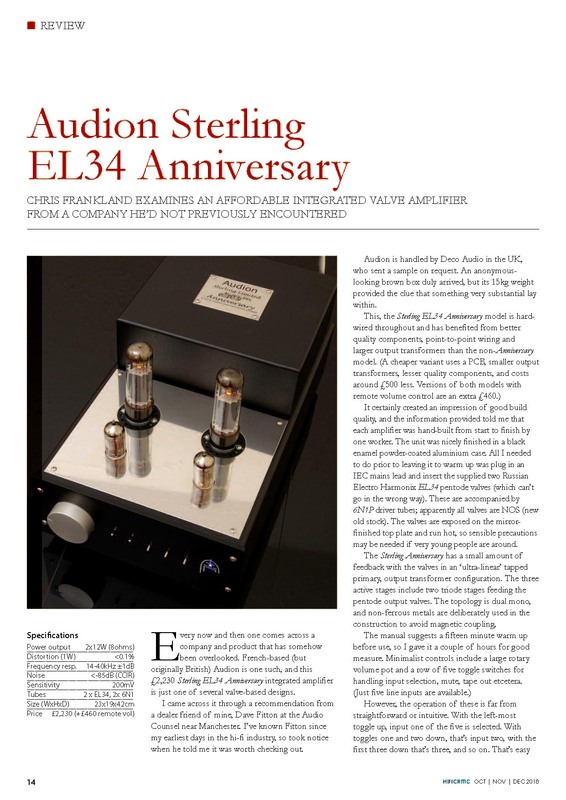 The Audion Stering 34 is auto biased and will take almost any EL34 (supplied with JJ tubes) delivers a conservative 12 CLEAN watts into 8 ohms. Has the power of competitors boasting 24-30W. This next level combination makes for smooth transients, good signal handling and tight response curves. There is an audible difference with the Audion Anniversary products, due to the larger transformers and better grade components over the Mk1 printed circuit board models. This pentode based EL34 stereo amp uses a small amount of feedback in the design. This Audion Sterling is suited for use with loudspeakers of 89db or better efficiency. 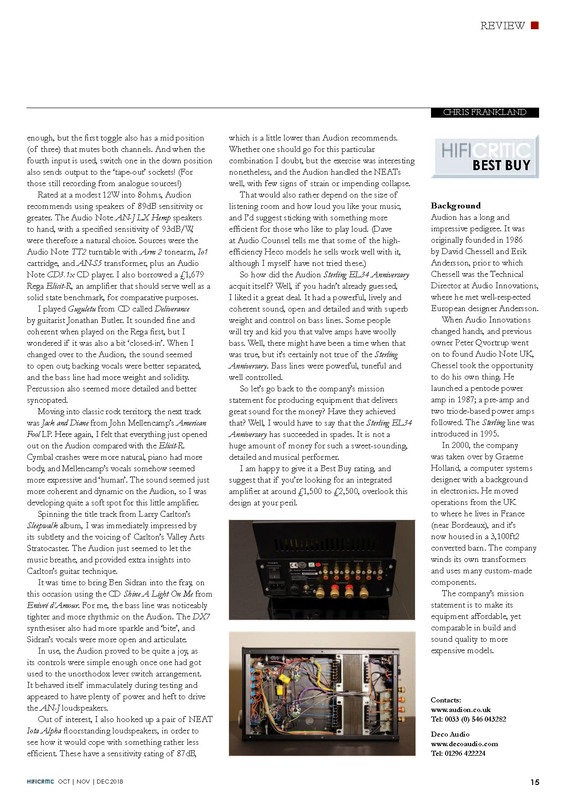 The Audion Sterling is a good entry level hard wired Class A power amplifier at a very appealing price. 2 years.